Maya Expert: The 'End Of Times' Is Our Idea, Not The Ancients' : The Two-Way "The Maya never, ever, said anything about the world ending at any time — much less this year," says an archaeologist who helped translate the ancient culture's hieroglyphs. Tourists are seen in front of the "Gran Jaguar" Mayan temple at the Tikal archaeological site in Guatemala, where ceremonies will be held to celebrate the end of the Mayan cycle known as Baktun 13 and the start of the new Maya Era on December 21. Update at 7 a.m. ET, Dec. 21: We're Still Here. It is Dec. 20, 2012 — and citizens of Earth are panicking, consumed by the idea that the world will end Friday, something they say was predicted by Mayan astronomers. Of course, most people are not panicking, and Maya expert David Stuart says no one should. The calendar, he says, has plenty of room to go. In an interview airing on Thursday's Morning Edition, David Greene asks archaeologist Stuart, who helped translate influential ancient Mayan hieroglyphs in 1996, if he thinks the world will end on Dec. 21. "Absolutely not," is Stuart's answer, dashing the hopes of students eyeing a three-day weekend, and any consumers who maxed out their credit cards in the belief that all history — not just their credit history — would come to an end. "The Maya never, ever, said anything about the world ending at any time — much less this year," says Stuart, a professor at the University of Texas at Austin. "So, it's sort of bizarre to be living through this time right now, when so many people seem to be worked up." And worked up they are. Apocalyptic rumors and doomsday preparations have preoccupied people on seemingly every continent. In Russia, citizens are stocking up on vodka; in China, nearly 100 people were arrested for spreading the rumors, which officials said were partly to blame for an attack on elementary students Friday. In an international poll of more than 16,000 people, Reuters found that 1 in 10 respondents worried that the Mayan calendar could signal the end of the world. The poll, which was taken in May, also found that 15 percent of those responding said they "believe the world will end during their lifetime," Reuters reported. The current panic has been bolstered by theories that might charitably be deemed "sciencey." Under one scenario, the Earth would not survive a rare galactic alignment that would subject it to the powers of not only the sun but also Sagittarius A — a massive black hole in the heart of the Milky Way. In a related scheme, the planet's magnetic poles will reverse — possibly as a result of the alignment. Some doomsayers even claim to know the exact time the bell will toll for Earth: 11:11 UTC — a nicely evocative time, yet one that the U.S. Naval Observatory says is off by one minute. If you're in the Eastern U.S. time zone, the facility says, you should expect the solstice to occur at 6:12 a.m. Friday. The fuss stems from the fact that "an important cycle of the Maya calendar which is turning over," Stuart says, "called a baktun." Each baktun represents 144,000 days — or nearly 400 years. The 13th (and, some say, final) baktun of the Mayan calendar is slated to come to an end on the solstice marked on Dec. 21, 2012. "It's a big deal — if you're an ancient Maya astronomer priest," Stuart says. "But apart from that, they didn't say anything about ... what will be happening." Stuart and other researchers have compared what's about to happen to the Mayan calendar to an odometer on a well-driven car: The years will simply click over. If the car's odometer runs past its complement of numbers, you can still drive it. 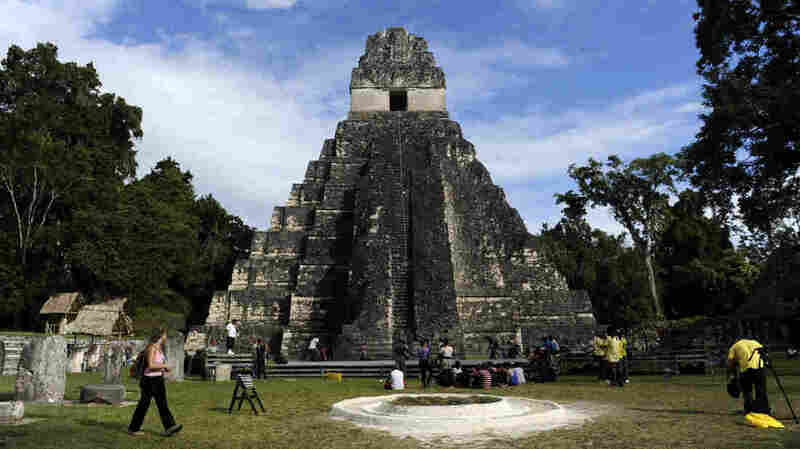 The end of the calendar cycle is a cause for celebration in Guatemala, home of the famed Tikal Mayan temple. The country is already welcoming an influx of leaders from the region, as well as around 200,000 foreign tourists, reports the Prensa Latina news agency. On his blog, Stuart has admitted that he inadvertently helped to fuel the 2012 doomsday movement when he labeled his analysis of a glyph found at Tortuguero as the "Tortuguero Prophecy," a title that fueled ideas of a revolutionary dawning of a new age. But in a recent post, he projects that the Mayan calendar has at least 2,400 more years to go. "I think in our culture, too, or maybe globally — humans like to come up with excuses, sometimes, just to freak out," he tells David. "I think the Maya have become an excuse for something a bit larger. ... It's a reflection of a lot of tension, a lot of anxiety in our society. And Lord knows, there's a lot of real problems out there. But this isn't one of them. You know, the Mayan calendar is certainly not something we need to worry about." So, David asked, how will Stuart spend Dec. 21? "I'll be here in Austin that night," he said, "and probably raise a glass of wine to the end of the baktun, and the beginning of a new one." But not everyone will be as relaxed as the professor. The website Off World Backup pokes fun at the trend of "doomsday preppers," offering what it calls "quantum bilateral encryption" and the assurance that "your data will be secure no matter what happens on Earth." "I acknowledge that my files will not actually be backed up off world. "I also acknowledge that it is silly to believe that the Mayans correctly predicted the end of the world will occur on Friday (especially since they don't even believe that). "Furthermore, I acknowledge that no such thing as a multiphotonic phase inducer exists outside of this website and possibly Star Trek." Anyone who needs further convincing may want to consider the Mayan calendar's start date: Aug. 13, 3114 B.C. While few people can say what happened on that day, it's doubtful that any of them would say it's when the world suddenly sprang into being — along with a handy calendar. And Stuart says not to expect any major changes on Dec. 21, either. "Nothing is really fundamentally going to change, in terms of the world coming to a standstill," he says. "That is very reassuring," David tells Stuart. "I'm going to hold you to that." Some of our earlier posts about another "end of the world" prediction are collected here.